Mobile application development and distribution company Apps Daily Solutions Pvt Ltd has raised a Series B round of funding from Russian venture firm ru-Net Ltd, IndoUS Venture Partners (IUVP) and Qualcomm Ventures, the venture capital investment arm of Qualcomm Inc, one of the investors told Techcircle.in.. The total quantum of funding is pegged at over $5 million (Rs 31 crore). As part of the investment, Maria Krajukhina, CFO, ru-Net, has joined the company's board of directors. The funds will primarily be used to expand the company's product offering and retail distribution reach, as well as for talent acquisition. "We first met the company more than a year ago and witnessed tremendous growth, which it has managed to maintain ever since. AppsDaily has a very innovative business model suited to India and other emerging markets," said Maria Krajukhina. In 2011, the company had raised Rs 18 crore in its Series A round from IndoUS Venture Partners and Qualcomm Ventures. Prior to that, it had raised Rs 5 crore in 2010 from the Mumbai Angels. The other investor directors already on the Apps Daily board include Vani Kola, managing partner, IUVP; Rajiv Dadlani from Mumbai Angels; and Varsha Tagare, director, Qualcomm Ventures. Apps Daily develops and markets mobile applications across India and abroad. The company also focuses on developing and distributing cutting-edge software for mobile phones. Although unlike traditional companies that simply launch the apps on popular app stores (like Google Play or the iTunes app store), the company follows a unique model of selling and distributing their own and third party products through retail outlets across India. 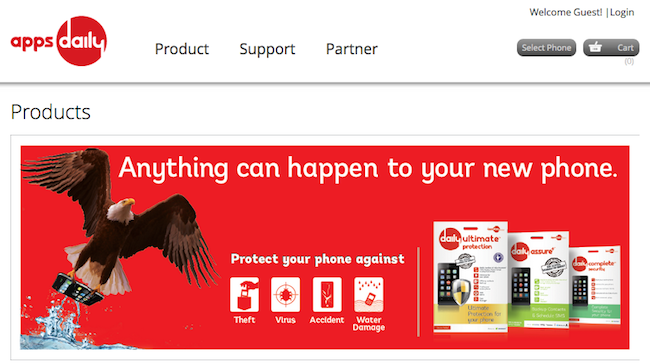 The products are sold under the brand name 'daily', for example daily cop, daily protect, daily assure, and daily complete security, among others. The Mumbai-based startup was founded by the duo of Arun Menon (CEO) and Ajay Menon (director) in 2008. Started as Onward Mobility, the company later rebranded to Apps Daily. Arun holds a B Tech degree in mechanical engineering from IIT Bombay and had earlier worked at companies like Billdesk and Tata Infotech. Prior to Apps Daily, Ajay had founded Ambrosia Infotech Ltd, a product engineering and consulting services provider across different verticals like telecom, internet, healthcare and retail. "This offline retail distribution model solves most of the pain points and gaps that currently exist in the other online and telco/operator distribution models like payment, discovery and support," said Vani Kola. The company has a presence in thousands of retail outlets, spread across more than 100 cities and 18 states in India, and employs over 1,200 people. It claims to have sold over 1 million products and has already achieved monthly breakeven. Fueled by the funding, it now plans to expand to more than 200 cities in India in 12 months and is also planning to start operations in other emerging markets. Besides, the company plans to roll out its partners' products including games, education, health and entertainment through its offline distribution channel in a few months. "Apps Daily has a unique offline, direct to consumer, distribution model which is definitely much more suited to the Indian market. And with more than 200 million mobile phones being sold every year in the country, the company's has potential to scale very rapidly," Dadlani said. Late last year, founders of IUVP had launched a new VC firm called Kalaari Capital, and raised an investment fund worth $150 million for the Indian market. While Kalaari Capital is deploying the money raised from the new fund, in the meantime, IndoUS as an entity remains and is also deploying its remaining fund. Last month, Bangalore-based Simplilearn Solutions Pvt Ltd, the company that owns and operates Simplilearn.com, an online education and training destination for professional certification courses, has secured $10 million in a Series B round of funding from Helion Venture Partners and existing investor IndoUS Venture Partners. Prior to that (June 2013), ru-Net, eBay, Japan's Recruit Holdings, Intel Capital and Saama Capital had invested $50 million in Jasper Infotech Pvt Ltd, which runs online marketplace Snapdeal. In February 2013, Qualcomm Ventures, along with Sequoia Capital (India) invested $1-$2 million in Dexetra Software Solutions Pvt Ltd, another mobile applications startup.